This morning I’ve got a fun giveaway for you all. 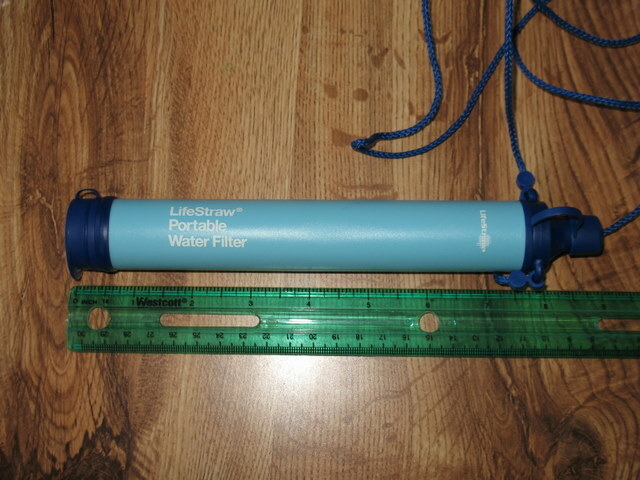 Remember my review of the LifeStraw water filter? Super lightweight water filter–great for your emergency kit. 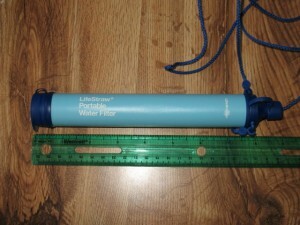 Well, Eartheasy.com is sponsoring a giveaway of one of their LifeStraw water filters to one of my readers. 1. What is the area you most need to improve on in your preparedness? 2. And what is an area of preparedness you feel you’re doing really well at? THIS GIVEAWAY HAS ENDED, BUT YOU’RE STILL WELCOME TO COMMENT. In order to leave a comment here, you are required to include an email address that only I get to see. That is the address I’ll use to contact you if you’re the winner, so use one that you check regularly. We’ll run this giveaway until next Monday, February 27th at midnight MST. The winner will be randomly selected from the comments and notified soon after. Good luck! 1. need to improve food cultivation skills. am sorely lacking here. 2. still at the very beginning, but have at least some food stored. I need to improve on my water storage and pet food storage. These are the two areas I just can’t seem to get ahead of, for some reason. I think I’m doing really well with medical supplies, paper goods, and food storage. Oh,and I don’t have the first dollar stashed away for emergencies. Need to address that one ASAP. I need to improve on personal safety, I’ve been thinking I need to research pepper sprays/mace and make a choice to buy. I also need to learn morse code! I’m doing really well in the life skills area, I could scrounge and create shelter, clothing, heat, and find plenty to eat. I most need to improve – disciplining myself enough to actually use the food products I’m storing and practicing the recipes I’ve got. I also WANT to get more experience handling our shotgun. I’m doing great at gathering in all my food storage. And I’ve got lots of water stored and ready. The area I most need to improve on is communications. If my family loses electricity & cell phone communication, we’re in a bad way. We do have a set of short-range radios but those won’t help us for more than a few miles. I know I need to learn more about this area, and start figuring out what will best suit my family’s needs. An area of preparedness my family is doing really well at is medical needs. My husband is a military corpsman (medic) who is graduating an EMT training course at the end of March, and my best friend (our roommate & a permanent part of our family) is a Licensed Practical Nurse currently enrolled in a Registered Nurse program. I’m very confident about our family being able to handle emergency medical needs after a disaster. I am doing good in the area of at home preparedness. We have a generator, plenty of batteries, extra meds,food, water… If we were stuck at home without power we’d be good for awhile. We are less prepared in the event we’d have to evacuate. We don’t have an exit plan, all our papers, clothes… in one place where we could grab and go and we don’t have a plan for what to do with the dog should the need arise! Knowledge and Wisdom. I never stop learning, studying, and applying what I learn. I need to improve my water storage. I am doing fine with my home canning. 2. Feeling pretty good about our food storage. Still need more but we’re off to a good start. Well, I’m in! Our preparedness specialty is theory, and our failing is practice. We’ve read all kinds of stuff, and moved to a spot where we can do the strange things we’ve read about without much interference from homeowners’ associations and nosy neighbors… but we haven’t been here long enough to really get everything put together. 1. Need to work on water – I know the basics, but I just haven’t done it. I’m going to start getting a gallon a week. Wow! I am a newbie so, I really have everything to improve on!!! But, I am reading and gathering knowledge!! I only wished I would have started this YEARS ago!! I think I fall short on how to have enogh water for 11 family members if times got hard and we had to survive on our own. I wish we had land that had fresh water in the form of a river, stream, or spring fed pond. I think I am doing my best at trying to collect enough long term storage foods, like buckets of beans, etc. Still one never knows what or how much you may need and who you may be feeding besides your own family. I think the thing I’m having the worst way is actually being able to apply all the homesteading things with. Have read alot, but I live in a subdivision with no way to have a garden, hang out my close or having the goats or chickens I want. Live next to the secretary and the president lives behind him so I can’t even be sneaky! 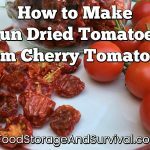 The best thing I’m doing well with is survival foods, dehydrating, etc. Question#1: Area we need to work on is water. We are looking to buy the Berkey however funding right now is short. Partially because of having to fund oral surgery first. Question#2: Area’s we feel confident about are defense and food storage. 1. We need lots more water than we are able to store. 2. We have done well with storing foods in a variety of ways such as canned, dried, frozen, etc. We’ve done well at collecting long term storage items & food items & some security stuff. Plus gardening & canning supplies. I need to improve on water storage for flushing and hens. 1. I need to work on pulling together an emergency plan. I have ideas in my head I need to work out on paper and get the family involved. 2. I think I have an okay start on food storage, but it is just a start. I fall short on backup energy. I need to get to work on solar power/wind power so I have some way to run the well. I would like to completely go off grid. I also fall short on knowing other preppers in other parts of the country. I think it would be good if we all knew preppers in other areas. If catastrophe strikes one area, we would have like minded individuals to escape to. My strength would be food storage and preservation. I raise a huge garden and can, freeze or dehydrate a lot. I also buried 2 old refrigerators to use as a cellar. I am getting honey bees this year and have access to goat milk and farm eggs. I know all my neighbors within a couple miles and few beyond that and we trade goods all the time. I need to improve our water storage. There is a lake nearby, but I am not certain how clean it is, nor am I certain it wouldn’t be guarded. We are doing pretty well on the first aid front. Lots of storage, both here and at my sister’s house. Doing well in food storage. Need work on the water supply. Have protection, food storage & canning down pat. Worry about fuel for generator, food rotation, communication and barter goods. Need to improve on financial stability and long term food storage. Doing well on short term food, water supply and security. 1. What is the area you most need to improve on in your preparedness? Right now more food storage and personal protection are the biggest priorities. although since we are somewhat new (6 months) to prepping we need help in lots of areas. 2. And what is an area of preparedness you feel you’re doing really well at? Honestly I am not real comfortable with any aspect except for maybe the 3 days of food. 1. Need to improve in the area of water stored….just do not have enough right now. And working on a possible alternative water source. 2. Doing well with storing general food items. Still have a long way to go, but it’s adding up fast! Recently put up lots of rice, flour and beans! Just getting serious about this stuff in the last year, but very encouraged!! Home prep is going well but things for “bugging” out like travel accommodations or at least getting things that are portable for use “on the road” are a big need! I don’t know if I feel really well at anything but I do feel like we are doing pretty good in the water and food storage area. !. My 72 hour kits need revamping, we just moved and couldn’t bring everything with us. 2. I am pretty good at knowing how to use the storage foods I have. Water filtration- started looking at how to’s and options.. Variety in my food storage and cook source options. I need to improve on food storage, i feel comfortable that I have a thorough knowledge of the gear I currently own. 1. I need to improve on our water storage. 2. We’re doing pretty decent on our short-term food storage. Definitely need to improve my energy generation abilities. I am doing well on long term food storage though. Moving to a safer part of the country. Such as North GA.or NC mountains. currently live near Jacksonville Fl. Not worried about Polar shift, I am worried about a EMP attack its a very real threat. and the 1 million people close to me. I would have to say all of them other than our location. We have a 1 year supply of food on hand, Seeds for several years for a garden, and we grow a garden every year. Have weapons and 3000 rounds of Ammo, Body armor. nigh vision. fish pond stocked with fish, several means to cook including a 1900 Wood burning cook stove which we just purchased. Also have a gas oven and range with a 1 year supply of Gas, 30 gals Kerosene Lanterns and camping cook stove. Have the means and chemicals to make Bio Diesel, and ethanol. Water Storage is no problem since we have a hand water pump and can filter rain water and pond water if needed. The area we’re doing well in is in food storage and the area we need improvement is water storage. The filter will help. Need to continue adding to my skills & knowledge base. I have my amateur radio license, but there is so much to learn in this hobby. Passing the test was the easy part. Would like to take a wilderness first aid class or similar. Have a good supply of food. Been gardening for years and canning. I need to improve on organization. I have a lot of food, but I have no idea how much. The area our family needs the most improvement on is water storage. We are currently thinking about a set of rain water catchers with auto filters. I have been a survivalist most of my life, from what I see, as of late, it has not been in vane.A lot of the web sites are giving out great information. I have taken notice of my local resoures from natural(wild) foods to what businesses have availible, if —- hits the fan. I also take notice of routes to and from these areas and map it out. I would like to suggest that others do the same so if something is needed to survive, you will know where and how to get to it. No one can have everything needed on hand,but where to locate it is essental. Doing the worst at having a large clean water supply- hope to install a hand pump into our existing electric well pump soon! Doing the best at food supplies- have a pretty well stocked pantry and lots of knowledge in gardening, canning and preserving, hunting, and foraging. Just started on my preparedness journey. So I wouldn’t be able to answer either. Thanks for the giveaway. I need to work harder on water storage. We live in the desert! I have a good supply of food and other items. I need to do better on canned fuel and copies of documents. I have some water and food. I work on that weekly. I most need to improve my skills – particularly marksmanship and physical fitness. We are fairly well prepared in food storage and cooking / preparing meals from our storage. Wife makes the best bread. 1. Area needing most improvement is self-defense; need to learn to shoot the pistol I bought. 2. We are doing a good job of long term food storage. Getting other family members on board with prepping for major events including the next hurricane season. My area or preparedness is the food and water storage. And I’d like to improve on personal safety and the safety of our house. Been working on my food storage for a little bit. I got a dehydrator for Valentine’s Day and drying potatoes and onions. The big thing that is lacking in my efforts is a water filtration system. Best prepared in cooking equipment and sources, fire starting, outdoor prep, fishing, and camping equipment. Least prepared in long-term food storage stocks. I’m VERY new to this, and feel that my greatest weaknesses are water storage and trying to get others close to me to see the importance of prepping. I’m doing good on producing my own food. Need to do better at keeping our 72 hr kits updated with food and clothing. Water, and improving my physical health. Waterneeds improvement and I am good on exit plans and food prep. We need improvement in more food and water. Making solar operated items for cooking food. Plus getting kids prepared is harder then I thought it would. They don’t seem to care as much as I would hope but they are learning. I need to improve water storage and ammunition supplies. I’ve got organic heirloom seed in my garden and learning how to can foods.